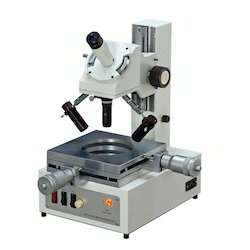 Offering you a complete choice of products which include tool makers microscopes. Eyepiece Protector 0-360° with adjustable vernier of least count 6 mins. A. Workpiece Holding Devices Micrometer Measuring Rotary Stage, Center Holding Device, V.Block, Vee Support. B. Depth Measuring Attachment For precise measurement of height/depth of any specimen (Z-Axis). E. PROJECTION ATTACHMENT Comprising of a projection screen dia 90mm; to be placed on the viewing eyepiece inclined at 30° and you can get a sharp focused image for measurement.